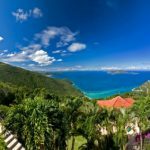 Located within a well-established residential area in Tortola, this exceptional Caribbean estate is on 5.25 acres of hillside land at an elevation of 1,100 feet above sea level. 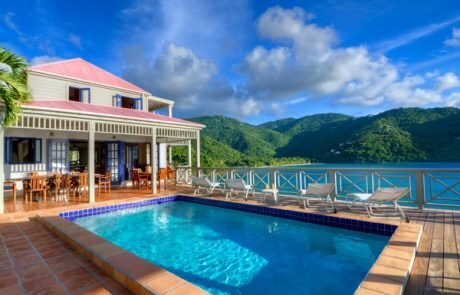 Shannon House is ideally located in the center of the island with the beaches of the North Shore and Road Town, all within a short driving distance. A winding driveway appointed with tall palm trees greets you as you enter the estate grounds. 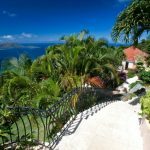 Stone steps lead from a parking area to the main house, which together with the master bedroom cottage and swimming pool terraces form the central feature of the estate. 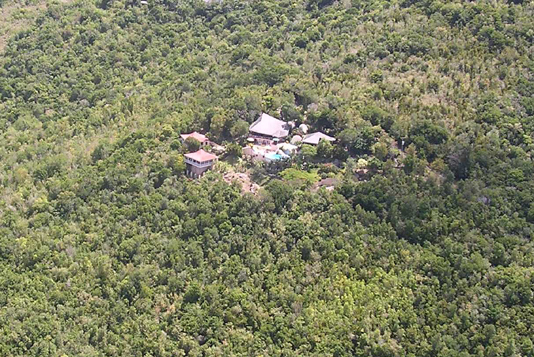 Once in the estate mature tropical landscapes, lush gardens and colorful fragrant fruit trees surround you. 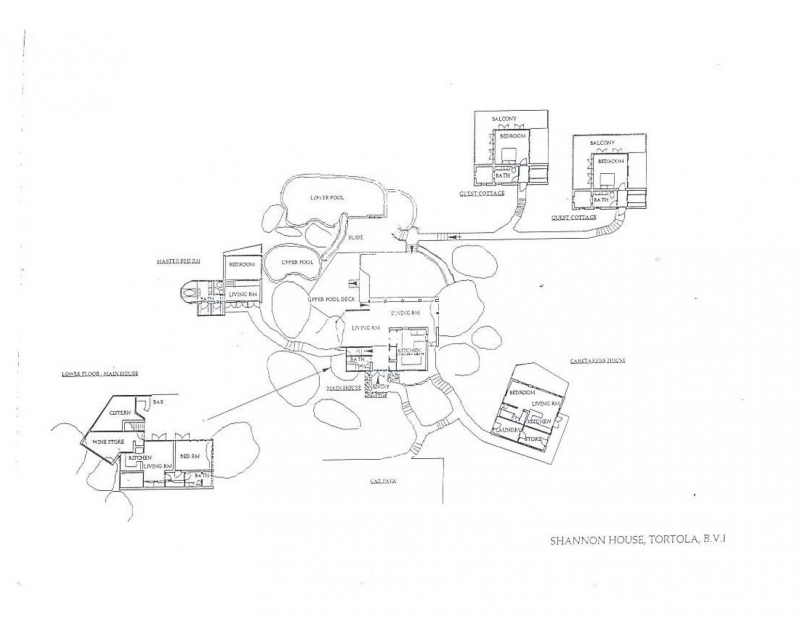 The residence, which was built in 1980, has approximately 5,500 square feet of indoor space. 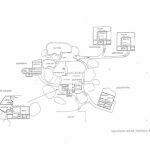 It has been expertly designed around many boulders found on the home site. 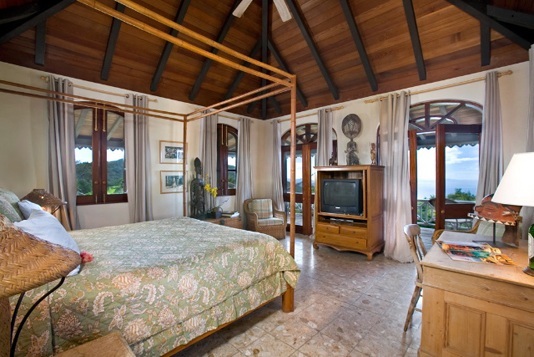 The estate consists of a main house with a large living and dining room, fully fitted kitchen, and two guest bedrooms. 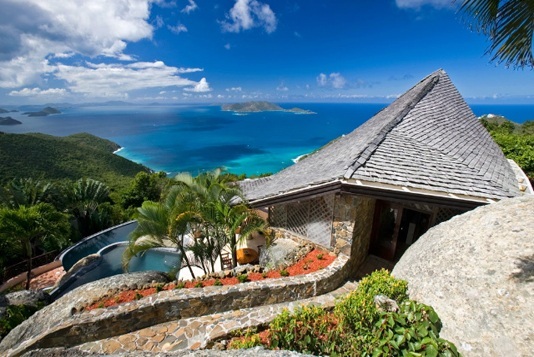 Automatic shutters open the lounge and dining areas to breathtaking north- western views. The mezzanine floor overlooks the lounge and dining areas and provides a comfortable entertainment room. 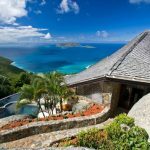 The central building in this estate is accented by a dramatic two-tier swimming pool along with extensive terraces. 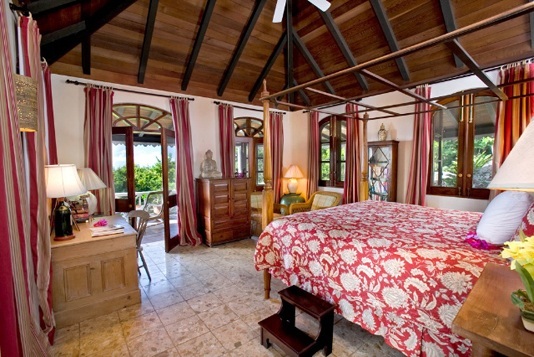 The master bedroom cottage is connected to the main house by a stone walkway and has direct access to the swimming pool. 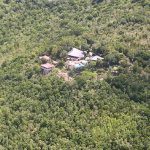 Two spacious guest cottages were added in 1990 and are situated at a lower elevation to the east of the main house. To the rear of the property is a self-contained caretaker’s cottage with an additional full bedroom suite below. 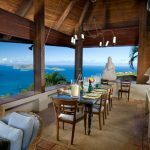 The Shannon House is set in a commanding position with the utmost privacy and incredible sunset views. 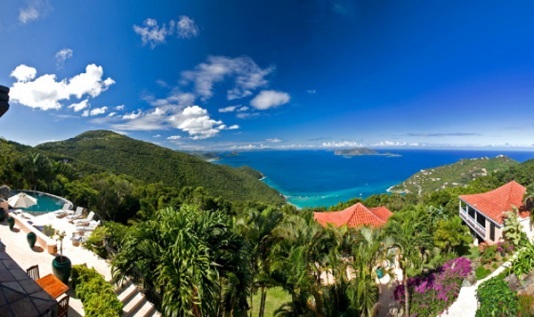 The extraordinary architectural design and character sets this British Virgin Islands estate apart from many others. 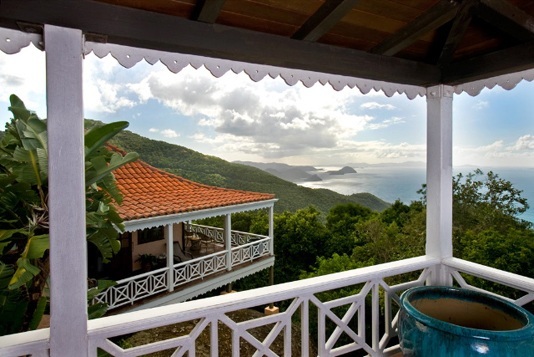 The central living area of the main house is the perfect place to take in the beautiful island panoramic vista. The main house is comprised of three levels; the lower guest bedrooms and the main and upper living area. Access to the building from the car park to the rear is on two levels with the lower entrance leading to the main living area. Steps lead from here to the pool terrace, down to the lower bedrooms and to the two guest cottages. The upper entrance foyer provides access to the living area along with a path leading to the master bedroom suite. 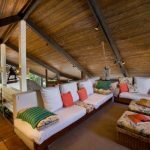 The home was constructed in 1980 with concrete and rendered concrete block under an exposed timber beam roof covered with Brazilian hardwood shingles. Mexican Saltillo tile covers the floors in the main house, master bedroom and guest cottage # 1. The living and dining area opens up with a double height ceiling. 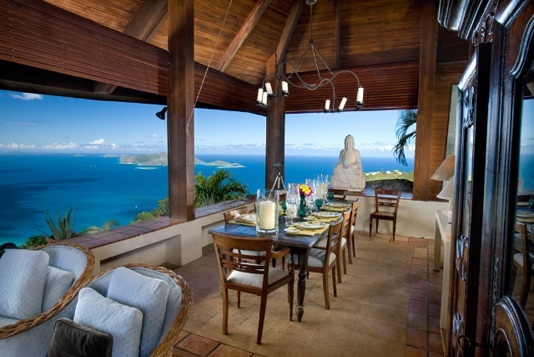 Windows to the front of the living area offer northwestern views towards Jost van Dyke. Automatic mahogany shutters enclose the bays for security and protection against the weather. 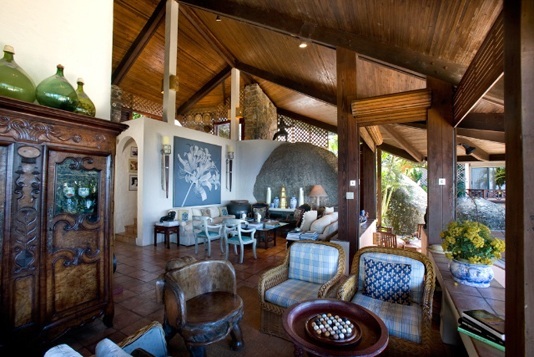 The main house features the natural boulders found on the land, which are built into the house with expert design. The fully appointed kitchen is located adjacent to the main living area and is accessible from the dining area. The kitchen features a center island, commercial size stove, refrigerator and freezer along with ceramic tile countertops. A full bathroom is also located on this level and is adjacent to the lower entrance. Stairs lead to the upper level entrance foyer where a small bridge connects the foyer to the gallery situated on top of the central kitchen core. This informal living area is located above the kitchen and overlooks the living and dining areas. It is currently used as a media/entertainment room. 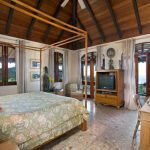 This spacious suite is situated beneath the main living area and is accessed from the lower deck area adjacent to the pool terrace. It includes two bedrooms a full bathroom, and a living area off one of the bedrooms. The striking feature of this 13 x 13 guest bedroom is a large boulder forming one wall. It is an example of how the natural features of the site have been successfully incorporated into the architecture. French doors open onto a deck area. Living/bedroom This room combines a living room and a bedroom, which is currently used as an office. There is corridor which leads to the bathroom shared by the two bedrooms. 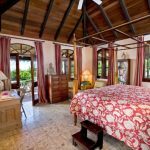 Located south of the main living area, the master bedroom cottage is accessed from the upper level of the main house via a path finished in local stone. The building mirrors the architectural design and detail of the main house and consists of a bedroom, upper living area, bathroom, and walk-in closet. 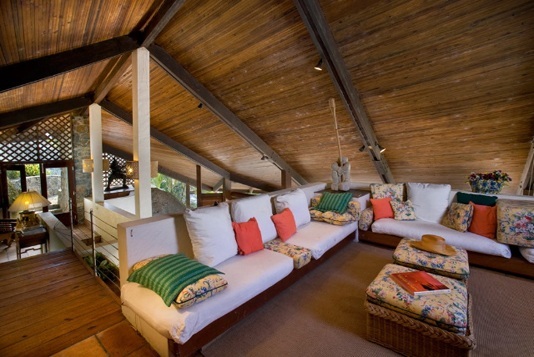 The central split-level room (236 sf) comprises of a bedroom on the lower level with sliding glass doors opening onto a balcony with timber steps down to the swimming pool. The upper level has been designed as a study area with a built-in desk. The bathroom suite features a twin basin set in a vanity and a sunken bath. 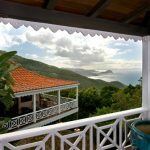 This two-story guest cottage/caretaker’s cottage is located approximately 100 feet north of the main living area. You may access the cottage via a beautiful stone path to the rear of the building. This cottage features an upper and lower bedroom suite together with a laundry and storage room. The upper level has a spacious open bedroom, living area and kitchenette with en-suite bathroom. Sliding glass doors lead to a private balcony. A laundry/storage room located at this level. The lower bedroom suite provides an en-suite bathroom also with a balcony. Guest Cottages 2 and 3 were built in 1991. Identical in size and design as guest cottage 1, the two cottages each offer a walk around covered balcony, bathroom with sunken shower area and dressing room. They boast marble floors, mahogany window and door frames. 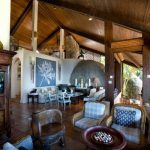 The cottages feature Brazilian hardwood decking and cathedral ceilings with exposed timber beams under a clay tiled roof. The bathrooms have marbled surfaces throughout with double sinks and sunken shower area. The swimming pool consists of two levels, which are connected by a waterfall and waterslide along with large boulders incorporated into the design. 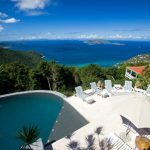 Both the pool and terraces take advantage of the views along the north coast of Tortola to St. Thomas and Jost van Dyke. 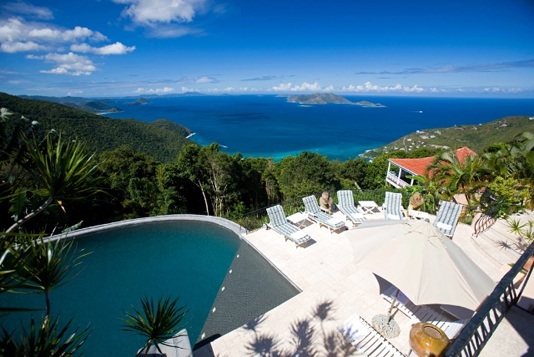 The pool is accessed from the main house with terraces at each pool level. The partially covered upper terrace has steps leading to the mid-terrace level. An enclosed bar is located at the west end of the terrace along with a temperature controlled wine cellar. 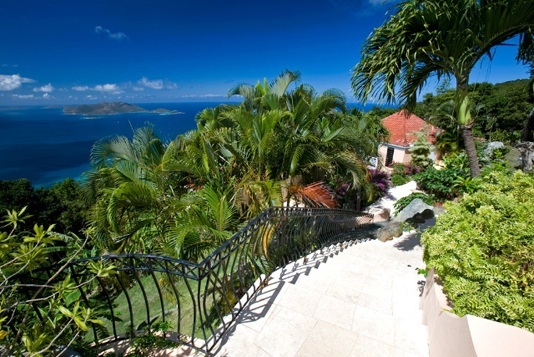 Steps lead down from here to the lower terrace provides an ideal area for lounging and entertaining. 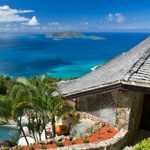 The land surrounding this beautiful British Virgin Islands house has been attractively landscaped with terraces, stone steps and pathways flowing between the home. The original paths from the main house to master bedroom, guest cottage # 1 and car park are all stone finished with stonewalls. The steps connecting the main house to guest cottages 2 & 3 are coral stone finished. Mature trees remain throughout the developed area to retain privacy and shade. 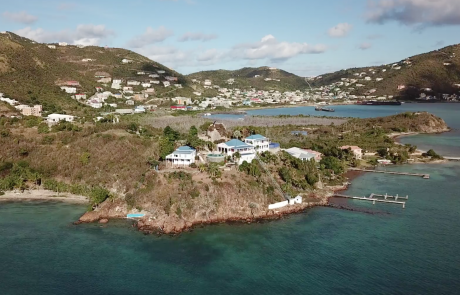 The estate sits on the southeast area of the home site, while approximately 3.75 acres remain undeveloped.